Sitting 6,225 feet atop the marvelous Sierra Nevada Mountain Range, Lake Tahoe is not only the USA’s second-deepest lake but the 26th largest lake in the world as well. 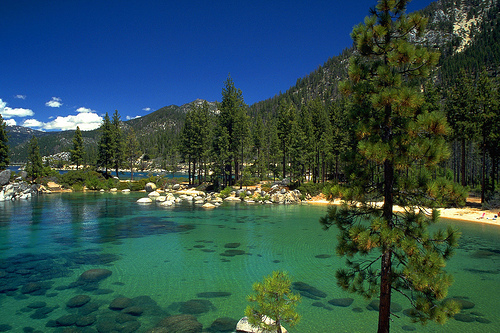 However, Lake Tahoe gained its popularity being a scenic masterpiece and a fountain for year-round outdoor activities. Lake Tahoe formed over 2 million years ago due to a natural occurrence and is famous for its rich-blue water. Although, the size of the basin stretches Lake Tahoe onto both California and Nevada’s borders—making it a major tourist attraction in both states. The region plays host to numerous ski resorts, casinos, outdoor recreation, as well as historic landmarks. Safe to say, Lake Tahoe is an unforgettable destination during the summer and the winter. Whether you are exploring by land, by water, or by air Lake Tahoe is a nature-lovers paradise. The Lake Tahoe area was first inhabited by the Washoe Native Americans. In fact, Lake Tahoe was located at the heart of Washoe territory that spread across Truckee Rivers, Carson, and Walker. In 1844, Lt. John C. Frémont was the first European to lay eyes on the enormous basin. Initially, the area was named “Lake Bigler.” However, Tahoe was soon introduced to the U.S. Department in 1862—derived from the mispronunciation of the Washo word meaning “lake.” Subsequently, California and Nevada agreed to partition Tahoe between themselves when Nevada became a state in 1864 as well. Lake Tahoe’s industrial history started with mining—specifically silver—and logging. In 1858, Comstock Lode supplied incredible timber to Comstock miners. Unfortunately, the logging went overboard and almost killed the native forest. Lake Tahoe’s true potential was first discovered in 1864 when Tahoe City got recognized as a future resort destination. Hence thereafter, the Tahoe basin’s popularity increasingly grew. By 1918 Lake Tahoe was a national park and the water storage for the Truckee-Caron Irrigation District. Now, both residents and travelers populate the surrounding region. Who would want to miss the incredible view after all?